Is paramotoring safe? This is by far the question that I get asked the most! Paramotoring will always have its risks, as will any type of aviation. There have been some very nasty accidents, in the air, and on the ground, but the majority were caused by pilot error. By following some simple advice that I will go over in this article, you can make paramotoring safe for yourself and for others on the ground. Since learning to fly in 2013, I've discovered the most common way for pilots to get injured is on the ground! This happens before they're even strapped into their paramotor, and usually ends in disaster. Pilots have lost fingers, hands, and have been left with life changing injuries. As a new pilot, this may scare you; but to make paramotoring safer, we must learn from these mistakes. And by understanding why these accidents happen, we can prevent them reoccurring in the future. So what is happening to cause these terrible accidents? 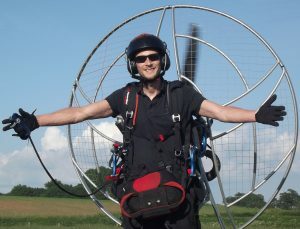 The main problem seems to be with people trying to start their paramotor on the ground, without being strapped into it. A simple jammed throttle causes the engine to go to maximum RPM, it flips the paramotor over, and the propeller hits the pilot. So what's the solution? A few pre-start checks will go a long way in preventing this from happening again. First off, always strap yourself into your paramotor before starting it. If you have problems starting it while it's on your back, ask somebody to pull the cord for you. Always ensure that the cruise control knob on the throttle is fully unwound, to prevent it gripping the throttle. 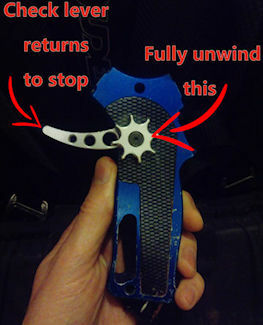 These vary on different paramotor models, but the picture below shows what to do with a Parajet throttle. Also check that the throttle lever returns to the stop with a nice smooth action. You should also check that the throttle returns to the closed position on the carburettor. Listen to hear the butterfly in the carburettor hitting the stop, and check that the cable is running nice and free. If any of these checks fail, then don't start the motor, even if it's on your back. Another thing you need to be aware of on the ground, is the throttle cable being able to pass through the gap in the cage. This has happened to myself, and luckily the only consequence was the throttle cable getting minced. Unfortunately, others haven't been so lucky; cables have gotten caught in propellers, and pulled pilots hands in with them. One way of overcoming this problem is by wearing the throttle slightly different. The video below isn't mine, but it explains how to avoid this situation, and I'm sure he won't mind me sharing it. A few more things to note about safety on the ground. Always wear a helmet, a simple trip whilst launching could end badly. Always call out to let anybody close by know that you are about to start your motor. "CLEAR PROP" is the standard call. Tuck in hoods, long hair, and anything else that could get sucked through into the propeller. As previously mentioned, if you have the option, it's always better to strap into your paramotor before starting the engine. This prevents most types of propeller injury, and a jammed throttle will usually be a non event. But sometimes you have to start your motor on the ground. This could be to work on the engine while it's running, or maybe you struggle to start the engine while you're strapped in, and nobody is there to help you. This is where the propeller strap comes in really handy. The propeller needs to turn in order for a non clutched engine to start, so the safety strap will only work on clutched engines. We'll look at non clutched engines shortly. The prop safety strap idea is very simple: you take a piece of rope, or a strong nylon strap (press buckle straps work great, as shown above), and you attach it to your frame. As you can see I attach mine to the upper cage section, but the V3 cage is very strong. If you have a sturdy cage, go ahead and place the strap around it, if not, use the frame. The other end of the strap is placed around the propeller, far enough down that it cannot slide off if the prop begins to turn. If you're using any type of buckled strap, be sure to keep the buckle on the frame side so that it doesn't damage your prop. And that's it! You have a paramotor prop safety strap that may one day save you from a serious propeller injury. If you start the engine and the throttle jams wide open, the strap comes into play and the prop simply cannot turn. When the engine is running, and you're sure that the throttle is not jammed, you can remove the strap ready for flight. If the engine sounds unusual, or like it's trying to rev, do not remove the strap. Only remove it if you're sure the engine is ticking over as normal. You'll need to be very careful not to accidentally hit the power, so place the hand throttle on the ground, away from the area you need to stand in. 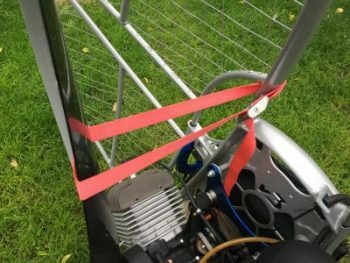 Remove the strap from the harness side, not the rear, and don't put your fingers anywhere near the prop, or through the cage. When the safety strap is removed, get into your harness and avoid touching the throttle until you're clipped in. The engine is then warmed up on your back. Another great thing we have in our defence against the dreaded finger mincer is the Safe Start. Scout have made this very popular, and they're currently the only manufacturer offering this option as standard on their paramotors. The Safe Start isn't new to the market, Scout actually tested the prototype over a decade ago, but it's still rare to see pilots using them. I'm not sure what's holding other manufacturers back, but I believe that these need to be fitted to all paramotors. 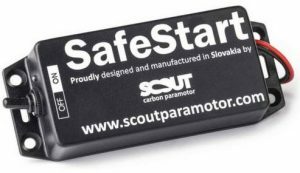 They can be fitted to any paramotor, and if you contact Scout or one of their dealers, they'll point you in the right direction. When the Safe Start is left in the on position, it will be in sleep mode, but it will be ready for action as soon as the engine turns over. Just a single pulse from the spark will wake up the device, and it will begin to monitor the engine’s RPM. As soon as the revs climb above 1000 RPM, the Safe Start device will assume that the engine is running. A 3 second safety period is engaged, and if the revs climb any higher than 2700 RPM, the device will immediately stop the engine. If the engine idles, and doesn't rev above 2700 RPM during the 3 second safety period, the device will shut down and leave you to enjoy your flight. I highly recommend that you fit a safe start to your paramotor. They can be fitted very easily, they're light, and the AAA batteries last for a year before they need replacing! So is paramotoring safe on the ground? The answer is very safe, as long as you follow these rules at every start up, and never get complacent. But is paramotoring safe once you're in the air? Let's find out. The biggest cause of accidents that I've seen since starting, has been caused by people playing around down low. By playing around I mean pilots doing tight turns, spirals, wing overs, and flying through their own wash. If you play low, you're playing dangerously. A bad exit from a wing over or a spiral can easily result in a wing collapse. If you're not high enough the wing will not recover in time, and you'll hit the ground. If you're going to practice acro, perfect your manoeuvres high up. Then, if the worst should happen, you'll actually have a chance to throw your reserve. Something else that can result from spiral dives is G-lock, this means you will black out. If you don't come around in time you'll hit the ground. I personally know how easily this can happen, in a tight spiral I very nearly lost consciousness..
Everything was going fine then suddenly the tunnel vision started, everything went red. Luckily, I was able to slowly let the brake handle up, I recognised what was happening in time. Others have blacked out suddenly, some haven't woken up in time, and have hit the ground in a full spiral. This has happened multiple times, and is also common in acro paragliding. I'd advise against even attempting spiral dives, the risk of blacking out is too high to mess with. Is paramotoring safe over water? There's something about water that attracts paramotor pilots. I regularly attend a fly-in that's located right next to the Severn river, and throughout the weekend I see so many pilots risking their lives flying low over the water without flotation. I'm not quite sure what the attraction is, but water has proven to be one of the biggest causes of death in paramotoring. If you're going to do it, you must have a flotation device fitted to your harness. Even with flotation you'll still be taking a big risk, and there's certain rules and precautions you will need to take. I've got a whole article dedicated to flying over the wet stuff, and you can check it out HERE. Is paramotoring safe in Strong wind? Strong wind isn't a problem as long as it's blowing slower than the top speed of your wing. If it's faster you may end up flying backwards, and find yourself unable to loose height. I can tell you from personal experience that this situation really isn't fun. The problems occur when the wind gets gusty. You may take off in 1 mph wind, but if there's a 20 mph gust you'll be in trouble. This can cause unpredictable reactions of the wing, and collapses. You should always check the weather forecast to make sure no strong gusts are due. Also, watch the wind for 15 minutes before flying to see what it's doing, the forecast isn't always accurate. Is paramotoring safe in midday thermals? 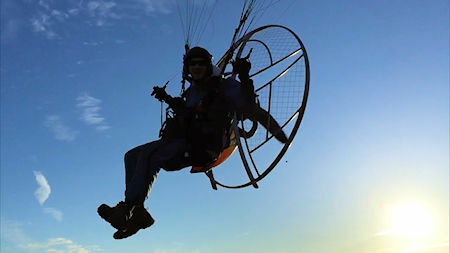 Paramotor pilots don't generally fly in midday thermals during summer months. It can be done, but this should not be attempted by inexperienced pilots. Stick to flying early morning before it warms up, and in the evenings when it cools down. You can usually tell if it's too hot to fly, as the thermals will create lots of wind. You'll also see lots of fluffy clouds forming in the morning as it heats up, this is a good indication to head for home. Is paramotoring safe in rotor? Of course it's not! If you're flying downwind of any object, you will be in the rotor. 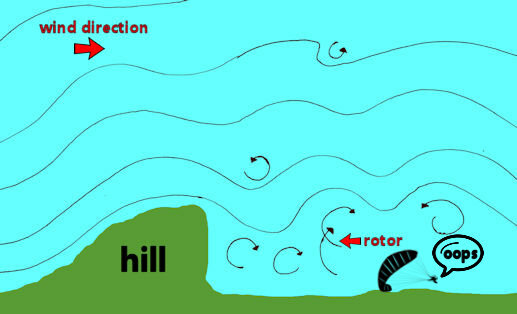 As wind hit's an object like a tall hill, it will create a swirling air on the other side called rotor. This can easily collapse a wing, and should be avoided at all costs. Even low winds can cause considerable rotor, so be aware of it at all times. Read all about paramotor wing collapses, what causes them, how to prevent them, and why they may actually be a good thing in > THIS POST. So is paramotoring safe in the air? It depends on a heck of a lot more than we've just looked at, so lets check out some more safety tips. Before you fly, you should give your paramotor a thorough check. This check should include the harness, frame, engine, and wing. Check the stitching on the harness, and the straps and buckles. Be sure to check all nuts and bolts on the engine to make sure they're tight, and also check the propeller bolts are tight. I know somebody that lost their propeller just after takeoff, this ended well and we laughed about it. But if a propeller fell off and struck a person on the ground, I hate to think what would have happened. Take a look at the hang points and the swing arms. Check the wing for tears, check the stitching and inspect the lines. And look closely at the cells, I once found a stiffening rod poking through the stitching on a low hour wing. Update march 2019: just a few days back I wen't to fly with a good friend of mine. He'd just had his wing returned from the loft (wing servicing and inspection company). They found an A line that was held together by a single thread! I asked him if he checks his lines regularly and he said no! Never ever neglect your pre-flight checks. If the wing hadn't been sent off, just one more flight would have been enough to snap the line and cause a crash. Write a checklist and tick it as you run these checks, this ensure everything is as it should be, and safe to fly. You can get a printable pre-flight checklist in my downloadable eBook HERE. Netting is placed around the cage to stop things being pulled through, and into the propeller. Just after I began flying I heard of a terrible accident in Australia. A very experienced pilot had failed to repair the netting on the top section of his cage. As he let the brake toggle go, it got sucked through the gap and caught in his propeller. This sent the glider into a steep spiral at just 100 feet. Unfortunately, there was no time to react and the pilot died. I've since heard about another similar accident involving brakes getting sucked into the propeller. To learn from this, you should always place your brakes on the magnets when they're not being used. If you buy a paramotor that has no netting like I once did, then put some on before you fly it. And if your netting ever gets damaged, don't fly again until it's fixed. If you need to install your own netting, be sure to avoid using cable ties around the outside of the cage. This can snag your lines during launch, and cause damage to them. I just mentioned always placing your brakes onto the magnets before letting go, in order to keep your brakes out of the prop. I once had a sewn on riser magnet that tore off while doing this mid-flight. I learned to always check that the stitching is in good order during my pre-flight inspection. If you suspect that your riser magnets are coming loose, or that they aren't strong enough to grip your brakes, get them changed before flying. Carabiners should be checked regularly and replaced every 100 hours, even if the manufacturer says that they will last longer. It's always best to err on the side of caution as there have been breakages. I recommend using stainless steel carabiners rather than aluminium ones. Although it's rare, aluminium carabiners have been known to crack, so if you use these, replace them asap. I've been using stainless steel carabiners by Austrialpin for many years now, and recommend them to everyone. Check carabiners before every flight, and when you clip in, make sure they're locked closed. Learn all about carabiner safety in THIS POST. I heard of a man that forgot to clip his leg straps up whilst paragliding, and fell out of the harness in flight. It's important to check, and check again, that all straps are clipped up before taking off. A six point check should become routine before every takeoff. Check both leg straps, chest strap, both carabiners, and your helmet strap. It's also important to carry out a full pre-flight inspection of your harness immediately before launch. This will reveal any blown stitching or worn out buckles. Never fly directly behind another paramotor as their prop wash can cause your wing to react unpredictably, or even collapse. Never fly on the exact same level as other pilots you're flying in close proximity with. A sudden gust could easily cause a collision, so always fly slightly higher, or lower. You can read about a very near miss that I had when flying at the same level as another pilot in THIS POST. If you regularly fly with other pilots then a radio is essential. It can be surprisingly difficult to see your wing man if he's behind, above, or even below you. A quick check by calling over the radio will ensure it's safe to climb, turn, or descend. Never land close to running motors on the ground, you could easily land into somebody else's propeller. Or your wing could fall into their propeller, potentially destroying it. Complacency has been a big killer in all types of aviation over the years, and paramotoring is no different. It's been said that besides training, all flights after the 100th flying hour are the most dangerous for paramotorists. After completing 100 hours, or about 12-18 months of flying, many pilots will start to become very relaxed about paramotoring, this is bad news for safety. Pilots may skip pre-flight checks, their tolerance to bad flying conditions is higher, and things that once sacred them will no longer seem important. Complacency kills, so treat every flight as you did on your first solo. Things that seemed dangerous back then, probably seemed dangerous for a very good reason. So never forget how quickly things can go wrong, and remind yourself of the dangers regularly and habitually. When I fly, I never go up without my reserve parachute. A reserve is packed into a small container that mounts to your harness. If anything untoward happens, you will be able to throw it as a second chance. It will open up just like an old fashioned jellyfish chute, and safely carry you down. Before you takeoff, make sure the locking pins are secured to prevent an accidental deployment. Have it checked and repacked once a year to keep it in tiptop condition, and never fly without it. To make a reserve parachute descent even safer, you may wish to buy a steerable reserve. This will keep you away from potential hazards on the ground, like water, power lines, power stations, and buildings. A standard jellyfish type reserve will carry you down safely, but you'll have no choice over your landing spot. So in general, is paramotoring safe? Nothing is ever completely risk free, but paramotoring is considered very safe. You're generally, and statistically more likely to die travelling to the airfield in your car, than you are flying a paramotor. As you've just read in this article, accidents have happened, but it's rarely, and maybe never because of equipment failure. Pilot error is the number one cause of paramotoring accidents. If you go out to fly by yourself, early on a still morning, or on a calm evening, the conditions will be perfect. If you follow all of the advice in this article before and during each flight, you'll be pretty damn safe. If the mere thought of paramotoring makes you anxious, or if you really want to try paramotoring but you have a fear of flying, check out This post. Find out whether paramotoring is safer than paragliding > HERE. And read an in depth report on the most common accident in paramotoring HERE. New to paramotoring? Find out all of the equipment you'll need to get before you can start flying > HERE. And a few more essentials for your kit bag > HERE. 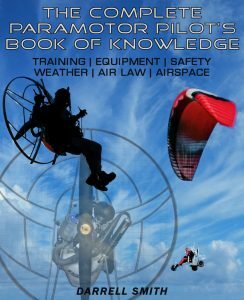 Check out my paramotoring theory of flight explanation and discover how paramotor wings work HERE. Pingback: Paramotor wing collapse - What's the chance of a collapse happening?